Meyvn is a company specialising in the improvement of mining organisations through training and consulting. In addition to knowing the ins and outs of mining, Meyvn’s trainers know how to teach. Our specialties include: supervisor training, change management, safety auditing, safety training, heavy equipment training, team building, soft skills training, MSHA related training and consulting. Meyvn trainers do not just teach from the classroom; they operate equipment and provide live training. Meyvn operator trainers have international experience and have surpassed production goals in several locations due to their expertise and work ethic. At an iron ore mine in South Africa, Meyvn operator trainers were able to break single shift production records for five consecutive weeks, bringing the site’s tonnage record of 280,000t up to 340,000t. If you are looking to safely increase production, Meyvn has the resources to make that happen. Successful industry leaders need to be able to effectively communicate, coach, train, motivate and provide the necessary tools to their employees. Meyvn’s Leadership Development courses are designed to develop highly-skilled leaders who will contribute to the success of any mining organisation. Leaders need training and development in order to understand their complex responsibilities, learn about their employees’ needs, recognise and appreciate their employees and create cultures where ideas flow and accountability resides. The consultants who facilitate our Leadership Development courses have trained, coached and developed hundreds of leaders. Meyvn’s consultants know how critical it is to have effective leadership in the workplace and have spent years ensuring leaders are well equipped to find unbounded success. We have workshops on safety along with materials that will allow you to facilitate productive safety meetings in an engaging way. We do everything we can to ensure that our materials make a lasting impression on our students. Our workshops encourage teamwork, provide interactive engagements, and incorporate the most cutting-edge safety activities around. 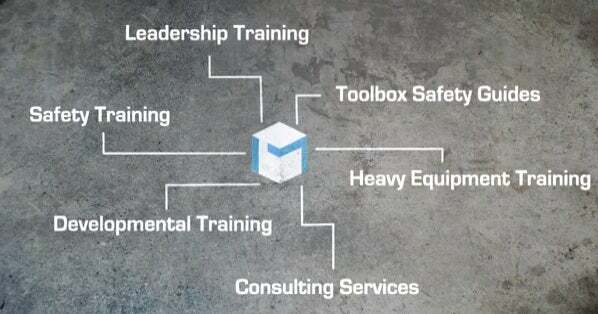 Meyvn’s Toolbox Safety Guides consist of innovative, comprehensive training packages designed to increase safety knowledge among participants in fun and engaging ways. 104 different topics are available, saving the presenter time and hassle. Many of the guides incorporate specific MSHA regulations so that everyone involved in the meeting can better understand the regulation. Each safety guide includes a clear set of objectives, an opening statement and an interactive activity designed to increase employee morale, participation and information retention. A Q&A section is also included for the presenter to immediately assess the overall effectiveness of the safety meeting. Steven Covey, in his book The Seven Habits of Highly Effective People, talks about the importance of continuously sharpening your saw. There is always opportunity for growth; organisations that seek out these opportunities and utilise their available resources typically lead whatever market they are in. There is power in objectivity and wisdom. Meyvn’s consultants are well versed in the organisational obstacles your company might be facing. From unproductive cultures to low morale, Meyvn Consultants have the solutions you need to turn things around. Let Meyvn Consulting play a role in the advancement of your organisation. We have the tools necessary to help companies sharpen their saws. With more than 100 years of combined experience working in mining operations, maintenance, training, planning and tires – the employees at Meyvn have a wealth of knowledge. Meyvn is committed to improving mining through world-class talent recruitment and a focus on creating sustainable change. Meyvn is dedicated to maintaining a people-first culture and operates through providing its most valuable resource, its people, the opportunity to work in an autonomous setting through which they can grow and develop their skill sets, obtain continuous appreciation and find passion in what they do. Everyone at Meyvn believes strongly in the power of people. That is why when Meyvn’s consultants come to your location they come with inspiration, wisdom, heart and a desire to truly make a difference. Lecture-style safety meetings are often unengaging, causing staff to ignore the content, and give safety training overall a dull reputation. Download the free paper to read Meyvn's seven principles of effective training and tips for retention. Many of our clients share a similar goal to streamline operations by, applying best practices and increasing operational performance. This strategic goal exemplifies exactly what we do at Meyvn Consulting. Meyvn is a dynamic, innovative and results driven organisation dedicated to revealing human potential through world-class training. This document highlights three of Meyvn's recent projects. The projects represent three main areas of our expertise: heavy equipment training, leadership development and safety training. For each project we include a brief overview of the project scope, examples of client feedback, and supporting documentation demonstrating the positive results of our services. Meyvn Asks: Can A New Employee Training Effort Make That Much Difference? In mid 2012, leaders of the Sishen mine brought in training specialists from Meyvn and made a new investment in employees that netted significant productivity and process returns throughout the mine's operations.